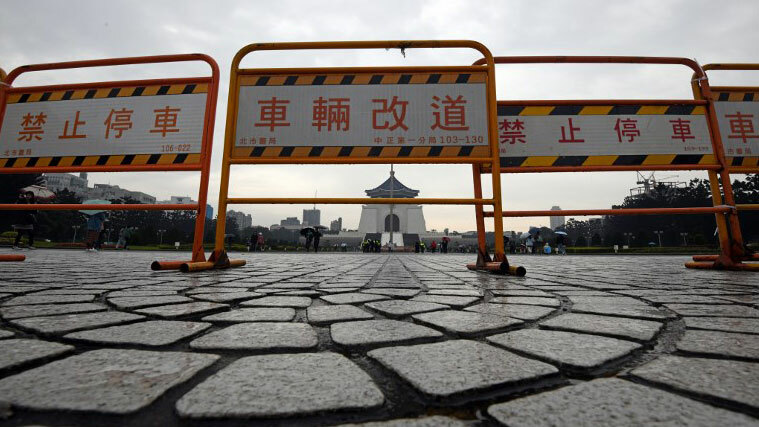 Barricades are placed at the entrance of the Chiang Kai-shek Memorial Hall in Taipei after protesters splashed red paint on the tomb of former ruler Chiang Kai-shek, Feb. 28, 2018. Taiwan marked the 71st anniversary of the Feb. 28 massacre on Wednesday, as the tomb of late Generalissimo Chiang Kai-shek, who presided over the killing, was covered by activists with red paint symbolizing blood. Hundreds of protesters earlier took to the streets in a call for justice for the victims of a Feb. 28, 1947 massacre of local civilians in which an estimated 18,000 to 28,000 people died at the hands of Kuomintang, or Nationalist, troops. Protest organizer Cheng Ching-hwa said families of victims say they still don't have details of what happened to their loved ones, amid growing calls for the removal of Chiang's statue and image from public places in the now democratic island. "We want to emphasize that this is a movement, not an activity, and the most important thing is that we want the government to speed up its work on transitional justice," Cheng told journalists. "We want Taiwan to become a normal, healthy country." Relatives of the victims are also calling on the government to list those responsible for the massacre in official records and textbooks, as well as opening up restricted records to researchers and historians. The KMT government, which relocated entirely to Taiwan in 1949 after losing a civil war to Mao Zedong's communists on the mainland, kept records of the era secret throughout its rule. Taiwan defense ministry spokesman Chen Chung-chi called on the public to remain "calm and rational" on the 71st anniversary of the massacre, the island's Central News Agency reported. But a pro-independence group of people calling itself "From Ethos to Nations" has claimed responsibility for the act, posting photos of the act of vandalism on a Facebook page, it said. "True transitional justice will never happen as long as national resources continue to be dedicated to memorializing the Chiang family," it said. Transitional justice provides a way of addressing large scale or systematic human rights violations so numerous and so serious that the normal justice system will not be able to provide an adequate response, according to a definition on the website of the International Center for Transitional Justice at www.ictj.org. Taiwan president Tsai Ing-wen, whose independence-leaning Democratic Progressive Party (DPP) routed the formerly ruling Kuomintang (KMT) when she took power in 2016, says her government is behind the approach. "Even 71 years later, the truth about the 2.28 incident will still be revealed," Tsai said in a speech later posted to her Facebook page. "In the past year, with the combined efforts of the National Archives, the Academia Sinica and the 2.28 Memorial Foundation, we have found details of more than 1,000 likely victims in government files," she said. "We will take the initiative ... to achieve the greatest possible clarification of historical truth," Tsai added. "The government will do everything in its power to make this happen." A 2006 report by the government-funded 2.28 Memorial Foundation found that Chiang Kai-shek bore the main responsibility for the killings, prompting victims' groups and social activists to call for an end to public veneration of the late Generalissimo. Further violence followed as the KMT imposed decades of martial law, including several waves of political purges of government opponents that saw 140,000 tried by military courts in an era known as the White Terror and thousands executed. Tsai's KMT predecessor Ma Ying-jeou said the paint-splattering protest at Chiang's tomb was "an act of vandalism" that should be limited, and that Chiang Kai-shek had also made hugely positive contributions to Taiwan's post-war development. "He did a lot to protect and rebuild Taiwan in the post-war era, but as the head of state at the time, of course he bears responsibility for the white terror of the 2.28 massacre and for anything else," Ma said. Taiwan began a transition to democracy following the death of Chiang's son, President Chiang Ching-kuo, in January 1988, starting with direct elections to the legislature in the early 1990s and culminating in the first direct election of the island's president Lee Teng-hui in 1996. Reported by Chung Kuang-cheng for RFA's Cantonese Service, and by Hwang Chun-mei and Hsia Hsiao-hwa for the Mandarin Service. Translated and edited by Luisetta Mudie. Taiwan under Chiang Kai Shek was just another dictatorship, the kind of government the USA, protector of human rights and proponent of freedom of speech detest but then, since he is the kind of dictator that the USA finds palatable, the USA embraced him and protected him. Today, with the dictatorship gone and replaced by democracy, the USA is singing a different tune. We support Taiwan because Taiwan is a democracy, respects human rights and freedom of speech. Oh dear, I just insulted the USA and I wonder if the man from Omaha is angered. This article is kind of partial. It does not cover opinions of those Taiwanese who appreciate the positive things Chiang Kai-shek had done on Taiwan and understand that Chiang has to do what he has to do to survive. He just lost mainland China and there were many communist spies in Taiwan working for the communist party at that time. The White terror is by nature inevitable at the unstable time like that. Chiang and his people wanted to live too. After that massacre Taiwan became more stable and Chiang worked pretty hard to make Taiwan soaring in economy. lot of courage there from 'anonymous reader' to insult taiwan without even giving his name! First Chiang Kai Shek was kicked out of the mainland by Mao Zedong, now he is about to be banished from Taiwan. Chiang should have allow Mao to take Taiwan island and ship all the gold and imperial treasures that he looted from China to the USA and like those fairy tales endings live happily ever after in the USA. Eventually every tiny trace of Chiang will be removed from Taiwan, a province of China. "But while the Chinese Communist Party has never ruled the island, Beijing regards it as part of Chinese territory and has threatened to invade if Taiwan seeks formal independence." Taiwan, with the protection and military support of the USA hasn't got the guts to declare independence because the USA will not allow it because the USA will not go to war with any country that has the nuclear capability to hit mainland USA. About the only countries that the USA dared to fight are those without nuclear weapons viz. Afghanistan and Iraq. Meanwhile the status quo is maintained and time is on China's side and Taiwan is losing her bargaining power by the day with more and more missiles aimed at her. Reunification with China is inevitable and a fait accompli.